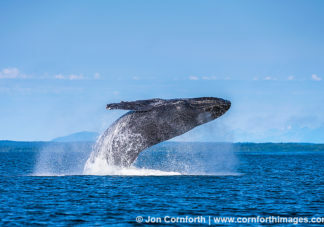 View humpback whale breaching photos, license humpback whale breaching stock pictures, and buy stunning humpback whale breaching prints by award winning professional photographer Jon Cornforth. To license an image for editorial or commercial use, click on the License Image button and fill out the form. To purchase a fine art print, select your image size and presentation style before clicking on the Buy Print button. No one knows exactly why Humpback whales breach the water in acrobatic displays. Whale song can be heard for vast distances, so its unclear what is being communicated by a breach that couldn’t more easily be transmitted through voice. Therefore, several theories exist to explain the behavior. Some think the whales leap from the water in order to transmit messages, possibly to signal to other whales that they are changing course. Others believe the breach is a mating display. Or maybe Humpbacks jump and twirl for the same reason humans do: the pure joy of leaping. When a Humpback leaves the water, it’s entire body forms a crescent during the jump. It then dives gracefully back in to the water. See more photos of humpback whales bubble-net feeding, aerials, blows, tails, and underwater.